Building air conditioners endure an extreme stress test during the dog days of summer when temperature are at their highest. A lot of older air conditioners can get through a warm spring, but fail when hot summer temperatures climb into the 90s and 100s. 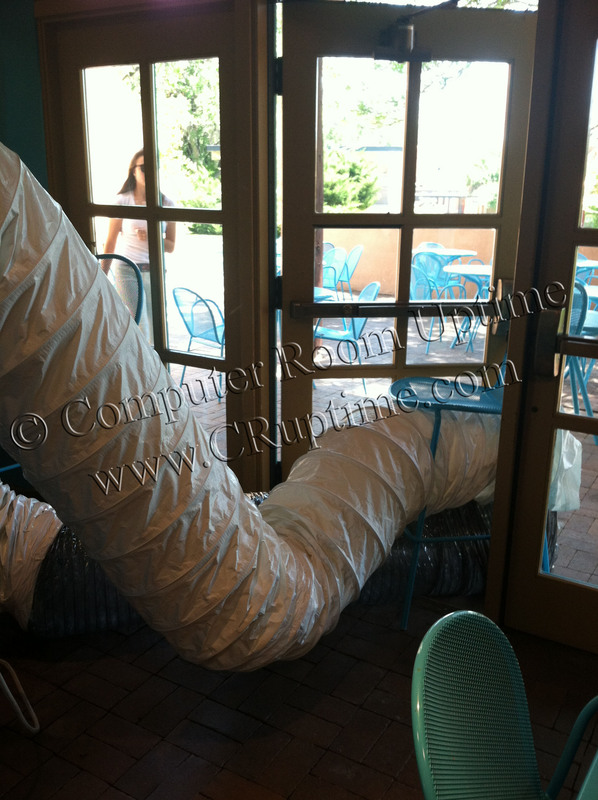 When your building air conditioner is down for repairs, you need to contact the cooling specialists at Computer Room Uptime for portable air conditioning rentals..
Computer Room Uptime worked diligently with a property manager in Colorado Springs to help keep their tenants happy while experiencing a building air conditioning failure. 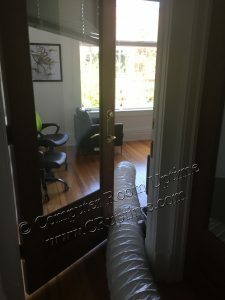 The rooftop air conditioner went down with a bad controller, and the technician informed them it would be 2 weeks before the part would arrive. The property manager urgently contacted Computer Room Uptime regarding AC rentals to keep their tenant cool while the main air conditioner was down. 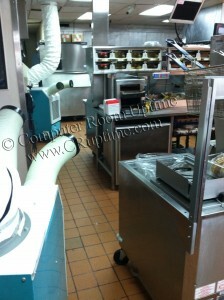 After consulting with a cooling specialist at Computer Room Uptime, it was determined that (5) portable air conditioners would be located throughout the suite to keep employees comfortable until the rooftop air conditioner was up and running again. Computer Room Uptime utilized 1 Ton portable air conditioners from MovinCool for the job. These portable AC units produce the largest temperature drops, have high airflow volume, and their reliability is unmatched. The spot coolers operate on 115V / 15 amp circuits (common everyday outlets – 5-15 NEMA plug), which makes them ideal for an office environment to easily provide power to all the air conditioners. The layout of the suite consisted of individual offices, which made things a little more difficult for the cold air to find its way into the individual offices. Additionally a few fans were used within the suite to push the cold air into the different offices to help keep everyone productive and happy. 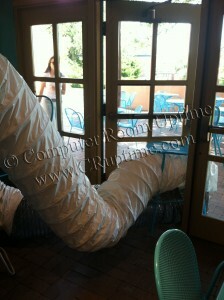 A byproduct of a portable air conditioner is the warm exhaust air that needs to be expelled out of the area. For this installation in Colorado Springs we were able to duct the exhaust air up into the drop ceiling plenum (space above suspended ceiling) for a clean and efficient installation. As it turned out the rooftop air conditioner was down for a month before the technician was able to replace the controller. 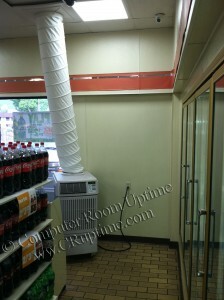 During the middle of summer it always seems that repairs take twice as long as they should, and it’s reassuring to know that Computer Room Uptime will always be there to help keep you COOL with our large fleet of portable air conditioning rentals. 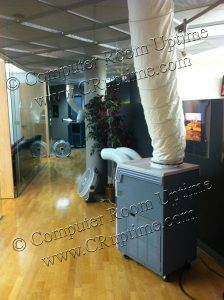 Computer Room Uptime is ready for all your temporary cooling needs throughout the state of Colorado and Wyoming. We have a large rental fleet of portable air conditioners, and offer same day delivery to your Front Range (Denver, Tech Center, Arvada, Higlands Ranch, Colorado Springs, Greeley, Brighton) location from our Denver warehouse. 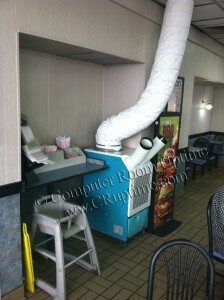 Please call Computer Room Uptime at 303-908-8043 for your next portable air conditioning rental. Spring brings crazy weather to the state of Colorado that wrecks havoc on air conditioning systems. Temperatures will soar to 85 °F one day, and the next day bring 8 inches of heavy wet snow. A lot of air conditioning systems will fail during the spring when huge fluctuations in temperatures from day to day are common..
One of the big casinos in Blackhawk gave Computer Room Uptime a call at 4 PM on a Friday in late April. 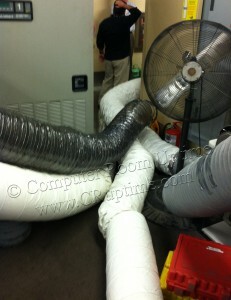 Their Computer Room Air Conditioner (CRAC) had failed and they needed cooling immediately. Not quite the 3 AM phone call that presidential nominees talk about in their campaigns, but for IT Administrators it’s a dreaded reality of their stressful occupation. The casino’s data center was heating up quickly, and EVERYTHING in the casino depended on the data center to operate properly. From slot machines and video poker to cash registers and reservation software, each revenue producing system depends on the reliability of the data center. Now put yourself in the general manager’s shoes, it’s the start of the weekend (the busiest time of the week) and you may have to shut your doors if the data center overheats. How happy would all the other casinos in Blackhawk be if your customers had to spend their money at other casinos? How would this affect the casino’s long-term reputation? 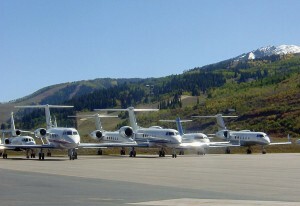 The repercussions can be long-term for customers that discover new casinos and never return..Within a couple of hours of the first phone call Computer Room Uptime was in Blackhawk with 5 portable air conditioners to provide emergency cooling to the computer room. 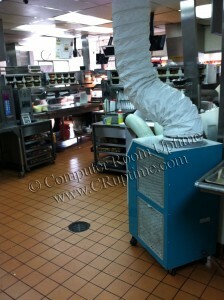 The spot coolers totaled 6 Tons of cooling, or 72,000 Btu/hr. of cooling capacity into their small computer room. Power was a concern, and the casino only had the following outlets available: (4) 115 V outlets and (1) 208 V. Therefore we brought a 2 Ton air conditioner that operates on 208 V, and (4) 1 Ton portable air conditioners that operate on 115 V to keep their server room cool. Higher cooling capacity portable air conditioners (2 – 5 Tons) operate 208/230 V, while the smaller 1 Ton air conditioners operate on 115 V.
One obstacle we had to overcome was the most efficient way to remove the warm exhaust air of the portable air conditioners. The data center was located in the basement, so there was not a drop ceiling plenum available to duct the warm exhaust air into the ceiling. 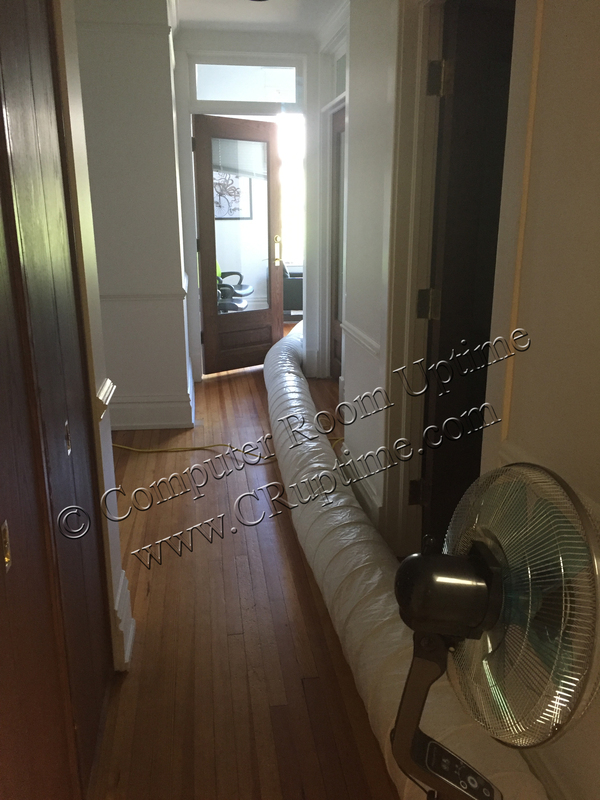 We determined the best way to remove the warm exhaust air was to duct it down a long hallway. At the end of the hallway we propped open a door to the outside of the building to get the warm exhaust out of the building. The ironic thing about the situation was getting the spot coolers into the building through the snow on the ground, but then walking into the server room 50 yards away and having temperatures in the 90s smack you in the face as you walked into the overheated data center..Within minutes after the portable air conditioners were setup inside the computer room the temperatures quickly dropped into the 70s. It definitely was not the most aesthetically pleasing installation we’ve done, but it was very effective at cooling the server room. Snaking all the exhaust ducts out of the data center door made it look like a deep sea monster (see picture), but the focus is always getting the cold air from the portable air conditioners directly in front of the server racks. Despite what it looks like, when renting portable air conditioners for emergency cooling the most critical objective is to keep your valuable equipment cool enough to operate properly. 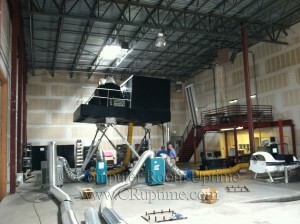 Computer Room Uptime prides itself in creating innovative solutions for your difficult cooling applications. We have a strong engineering background that allows us to push our air conditioners to the limit for your most demanding cooling applications. The past few weeks Computer Room Uptime rented the Aspen-Pitkin County Airport a portable air conditioner to keep their server room cool. 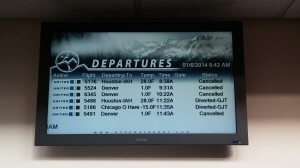 On July 1, 2014 the Aspen Airport launched a couple new video walls with high-definition flat screen TVs to broadcast a constantly updated stream of data to travelers: arrival and departure times, weather forecasts, anything that could affect their flights. 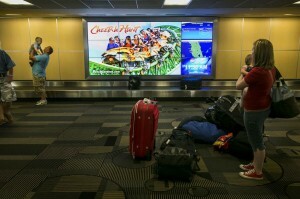 Additionally the video walls include advertising to everyone in the baggage claim area. The advertising revenue to the airport would be severely affected if the video wall went down due to the overheating of the server room that controls the video wall. Keeping the server room cool with a MovinCool portable air conditioner from Computer Room Uptime’s rental fleet was critical for the launch of the new video wall. The permanent air conditioner was not ready for the launch of the airport’s new display, so we worked with the airport to determine how much cooling was necessary and delivered the spot cooler within 24 hours of the initial call to help them out of their cooling crisis. In addition to the loss of advertising revenue due to the video wall shutting down, the IT equipment within the server room is also at risk due to an overheated server room. Developing and installing video walls can cost several million dollars. The Tampa Bay Times in July 2013 reported that the Tampa International Airport has been in the midst of a $7 million project to install similar digital signs. 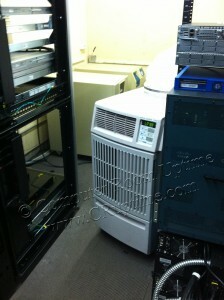 The equipment within the server room needs to be properly cooled, or the equipment can be lost due to overheating. Renting a portable air conditioner from Computer Room Uptime is an inexpensive way to reliably keep your IT equipment cool. 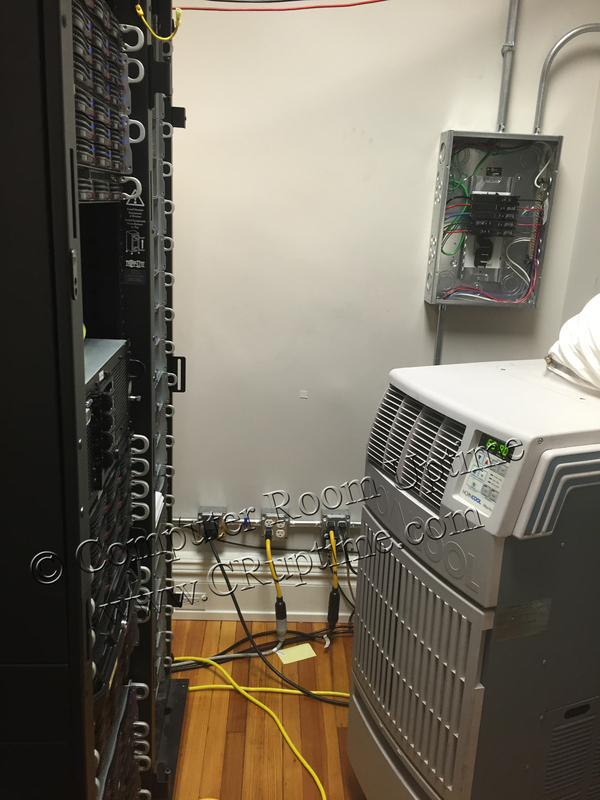 When you have over a $100,000 of network equipment that needs to be cool, you don’t want to cut corners with the air conditioners you use. Using MovinCool portable air conditioners are the most reliable ways to cool down your small server room. 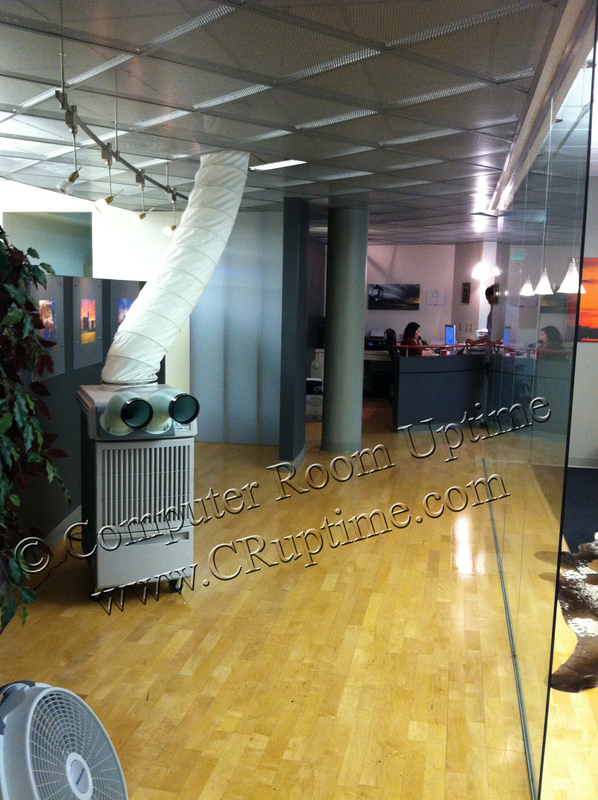 Computer Room Uptime is ready for all your temporary cooling needs throughout the state of Colorado and Wyoming. We have a large rental fleet of portable air conditioners, and offer same day delivery to your Front Range (Denver, Fort Luptan, Aurora, Parker, Boulder, Colorado Springs, Fort Collins) location from our Denver warehouse. Please call Computer Room Uptime at 303-908-8043 for your next portable air conditioning rental. Not only has it been hot here in Colorado, but we have had an unusual amount of humidity in the air which makes it feel even hotter. 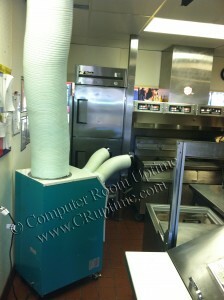 We have been receiving many calls from local businesses needing to cool down their food preparation areas. This is typically a small kitchen that houses many heat generating appliances (ovens, refrigerators/freezers, stoves, heat lamps etc.) as well as several people who prepare food. When it is hot outside this area can heat up to unsafe temperatures quickly. When temperatures get too high, food spoils at a faster rate, kitchen appliances (ice makers, ice cream machines, etc…) may shut down or fail and workers become less productive. Computer Room Uptime can help you avoid this situation entirely. Not only do our portable rental air conditioners cool, but they remove humidity from the air creating a safer, more comfortable working environment. We offer many different cooling solutions to meet your unique needs. Give us a call and we can assess which air conditioner would be the most efficient and cost effective solution to your cooling need. We will deliver and set up the portable air conditioners, and pick them up when you no longer need them. 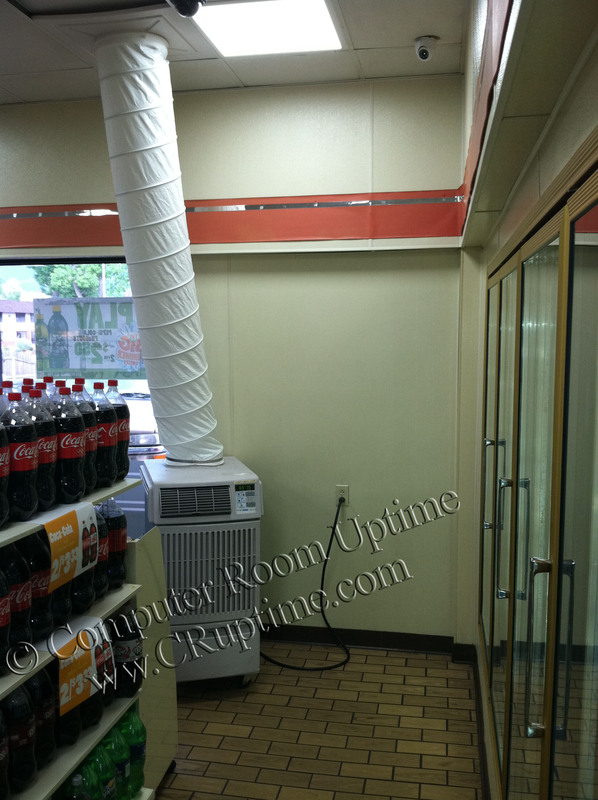 Typically our air cooled portable air conditioners work the best in kitchens, we’ll duct the warm exhaust air up into the drop ceiling plenum. 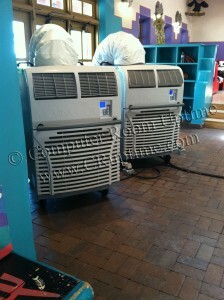 However we do rent water-cooled portable air conditioners as well. The water cooled portable air conditioners work well when you have easy access to water and a drain or sink. Water-cooled portable air conditioners transfer the heat in the room via water instead of air, so there is no exhaust being ducted into the drop ceiling plenum or outside. The water cooled spot coolers work well in kitchens because water and drains are readily available, while removing the exhaust warm air of an air cooled portable air conditioner into the drop ceiling plenum or outside is not always an option. Computer Room Uptime is ready for all your temporary cooling needs throughout the state of Colorado and Wyoming. We have a large rental fleet of portable air conditioners, and offer same day delivery to your Front Range (Denver, Highlands Ranch, Centennial, Lakewood, Boulder, Colorado Springs, Fort Collins) location from our Denver warehouse. Please call Computer Room Uptime at 303-908-8043 for your next portable air conditioning rental. The days are heating up here in Colorado and that means so are our homes. Many of us are fortunate to have a central air conditioning system in our homes, but what would you do if your air conditioner stopped working when the outside temperatures soared into the 90s or even the 100s? You would immediately call an air conditioning technician to fix or replace your air conditioner. It might take a few days or even a week to get the necessary parts needed to schedule the fix or replacement unit to be installed. Especially if it is HOT, technicians get really busy and it’s hard to get an appointment. Your family would gut it out, and be miserable for a week with the windows open and fans blasting. You might even spend most of the day at the mall, movie theaters, or stay at a local hotel. Now what would happen if the central air conditioner for a skilled nursing facility and assisted living facility failed? Not only can this be uncomfortable but it poses a serious health threat to elderly people. The residents can’t gut it out like your family and deal with the heat, or stay somewhere else for the week while it gets fixed. Renting spot coolers or portable air conditioners are a great temporary cooling solution for your facility. The increased risk of death associated with ambient health affects mainly old and very old people. Furthermore, an association between morbidity and heat-related mortality is well established . measures like emergency information systems or air condition supply could be easily applied in this setting. With this in mind most states require that the temperature remain between 71 °F and 81 °F in a skilled nursing facility or assisted living facility. If temperatures are determined to be above that the Department of Health is required to take action. This can be very costly and very stressful for residents and employees alike. The fines and loss of revenue that are associated with shutting down a facility is significant! Renting a portable air conditioner from Computer Room Uptime to avoid these problems is an easy and efficient solution. We offer same day delivery and installation. During the call we can assess all your cooling needs and provide the right amount of cooling to keep your facility running smoothly. Even if you do not have immediate cooling needs it is wise to establish a heat emergency action plan. Our contact information, Computer Room Uptime 303-908-8043, should be at the top of the list. We will help you create a comprehensive series of cooling measures to be taken to protect residents from the effects of excessively high temperatures. 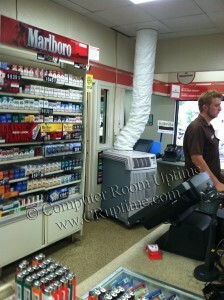 Computer Room Uptime is ready for all your temporary cooling needs throughout the state of Colorado and Wyoming. We have a large rental fleet of portable air conditioners, and offer same day delivery to your Front Range (Denver, Centennial, Superior, Boulder, Colorado Springs, Fort Collins) location from our Denver warehouse. Please call Computer Room Uptime at 303-908-8043 for your next portable air conditioning rental. Here at Computer Room Uptime we know our way around ducts. They are an essential part of spot cooling. 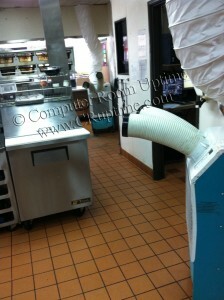 We use them to remove warm air exhaust and to direct cool air, otherwise known as spot cooling to areas of need. Determining which ducts will help maximize the efficiency of our portable air conditioners is a decision we take seriously. Every situation is different, so our professionals listen to exactly what your unique situation needs and will design a cooling remedy to exceed your expectations. 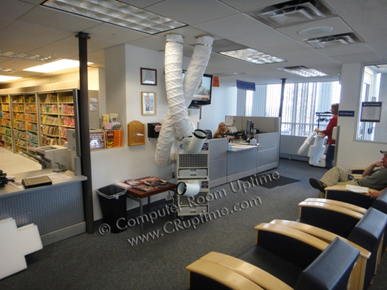 Computer Room Uptime uses duct-work for both permanent spot cooler installation as well as short term air conditioning rentals. Ducts come in many different shapes and sizes. They can be comprised of metal, plastic or even fabric. Some are rigid, some flexible. Most importantly they provide enough versatility to accommodate even the most difficult applications. This blog post contains a photo of a recent portable air conditioning rental we completed in Colorado Springs. 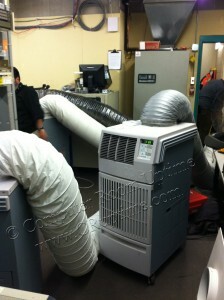 We received a call from a school that needed to cool off a large conference room. They had an important week-long conference, and their large rooftop air conditioner failed. They needed portable air conditioning fast. 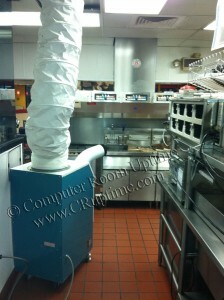 We typically ask if the room that needs to be cooled has a drop ceiling. A drop ceiling provides a great place to duct exhaust air allowing the building’s air handling system to remove it. 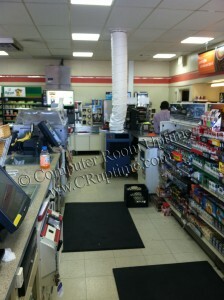 In this case there was not a drop ceiling that we could use so we went on to explore other options. Upon further questioning we were informed there were not any windows that opened or attached rooms that we could duct into. As you can see we still were able to accommodate this situation by using long 16” diameter flexible ducts to remove the warm air out one of the side doors in the conference room. We installed two MovinCool Office Pro 36 units inside the conference hall, which kept the 60 people comfortable during the day. The MovinCool portable air conditioners are quiet enough to be placed inside the conference room and not disturb the attendees. The two exhaust ducts were routed outside, and the rest of the doorway was masked off with plastic to keep the heat out. 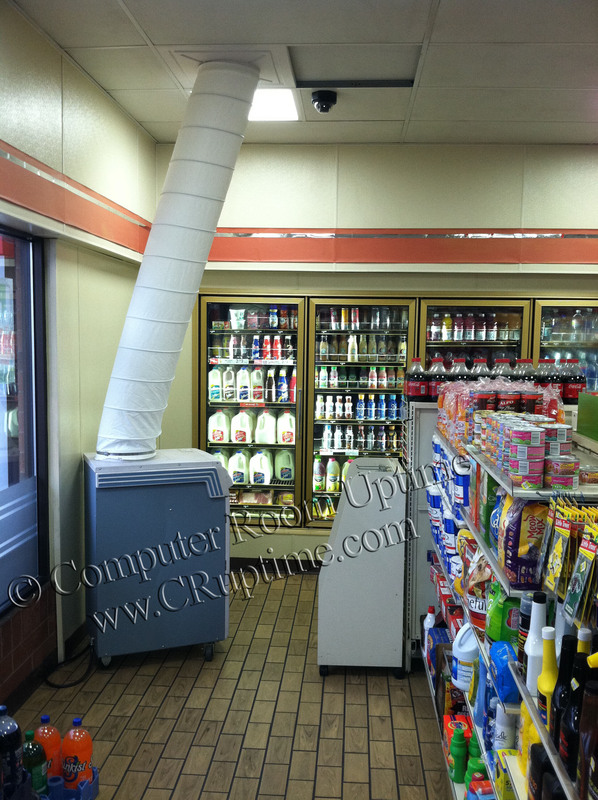 Other portable air conditioning rentals need to have the cold air ducted to a specific area that needs to be cooled. I am attaching a picture showing an industrial application where the cold air is ducted to cool down machinery so it doesn’t overheat, as well as the people operating it. MovinCool spot coolers are designed to handle long duct runs; their internal fans are capable of moving lots air with high amounts of static pressure. Computer Room Uptime is ready for all your temporary cooling needs throughout the state of Colorado and Wyoming. We have a large rental fleet of portable air conditioners, and offer same day delivery to your Front Range (Denver, Lakewood, Highlands Ranch, Boulder, Colorado Springs, Fort Collins) location from our Denver warehouse. Please call Computer Room Uptime at 303-908-8043 for your next portable air conditioning rental. 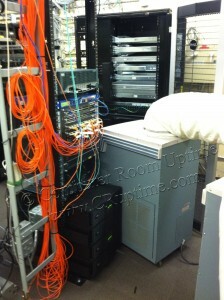 Computer Room Uptime has been noticing hot spots popping up more frequently in large data centers as computer servers become smaller with a higher heat density. Traditional computer room air conditioners (CRAC units) operating in a raised floor environment are having a hard time maintaining an acceptable temperature throughout the data center. Fortunately for IT administrators the data center is configured in a cold aisle / hot aisle layout, which is perfect to supplement with MovinCool portable air conditioners to keep servers properly cooled. Computer Room Uptime sells and rents MovinCool portable air conditioners to relieve all types of heat problems found in data centers or server rooms. MovinCool portable air conditioners are designed to spot cool a specific area within a larger area. Efficient data center cooling is designed in a similar fashion with a cold aisle / hot aisle layout. Cold aisles are created with the front of computer racks facing each other, while hot aisles are created with the back of computer racks facing each other. CRAC units blow cold air up through the raised floor in cold aisles only, while keeping the rest of the data center warm (i.e. spot cooling vs. cooling the entire data center). Computer Room Uptime works with our customers to spot cool the cold aisles within the larger data center to keep your servers operating properly. Maintaining the correct cool temperature in the cold aisle is imperative, since this is where servers draw in air to cool down their internal circuits. 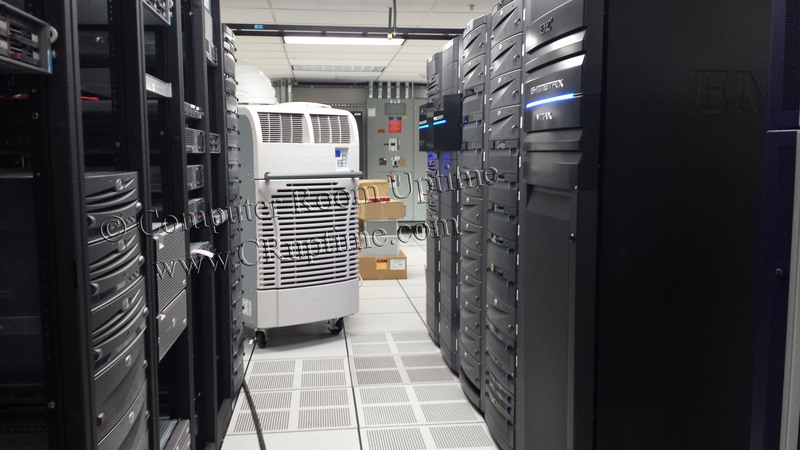 Hot spots within the data center occur when the large CRAC units located around the perimeter of the data center cannot keep certain cold aisles cool enough. Computer Room Uptime uses MovinCool portable air conditioners to eliminate the hot spots within your data center. The MovinCool will supplement the large CRAC units by spot cooling the cold aisles that have risen to dangerous temperatures. MovinCool portable air conditioners will eliminate hot spots at a fraction of the cost of installing another large 10, 15, or 20 Ton CRAC unit inside the data center. Computer Room Uptime will work with you to determine your needs, and how to best solve your hot spots within the data center. 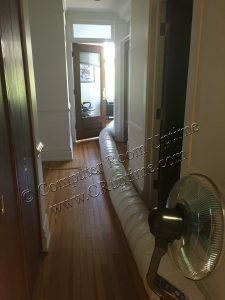 The portable air conditioner installs within minutes, and the casters make it easy to move around the room. 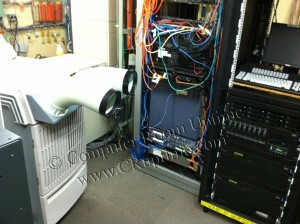 Therefore you’re able to move the portable air conditioner to wherever the hot spot occurs within your data center. As computer servers tend to get moved around the data centers so do the hot spots that they create and MovinCool portable air conditioners are the perfect cooling solution to combat them. MovinCool portable air conditioners range in cooling capacity from 1 – 5 Tons. Additionally all MovinCool portable air conditioners are designed to fit through any standard size door, allowing it to easily reach the data center wherever it might be located within the building. 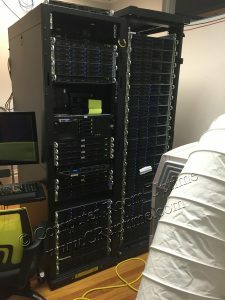 The pictures on the side of the blog post show how Computer Room Uptime recently used (2) MovinCool Office Pro 36 units located at the end of the cold aisle blowing cold air onto the hot spots within the data center. The MovinCool Office Pro 36 (36,000 Btu/hr – 3 Tons) and Office Pro 60 (60,000 Btu/hr – 5 Tons) can quickly cool down a data center that is in serious need of additional cooling. MovinCool portable air conditioners are an ideal cooling solution for your data center or server room. 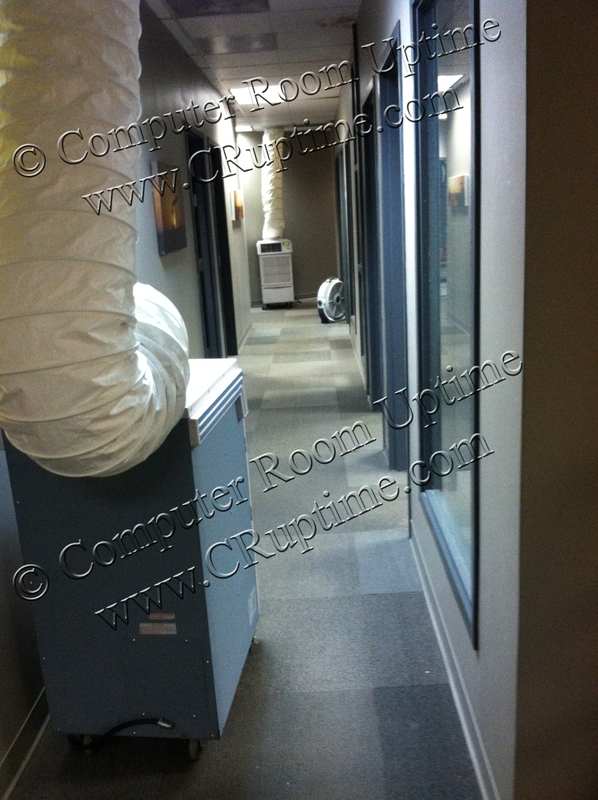 Computer Room Uptime uses portable air conditioners as the primary air conditioner, supplemental air conditioner, or backup air conditioner in several different computer environments. Additionally MovinCool portable air conditioners are an inexpensive insurance policy for your data center or server room, in case your primary air conditioner fails. 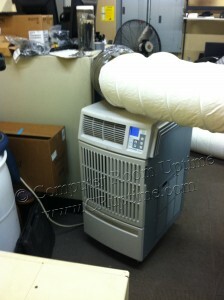 The portable air conditioners can be stored in a closet at your facility or they can be rented from Computer Room Uptime, the air conditioners can then be rolled out and installed within minutes to quickly lower the temperature in your data center. A small investment with the MovinCool portable air conditioners will save you hundreds of thousands of dollars worth of IT equipment during an unplanned cooling emergency. Computer Room Uptime is ready for all your temporary cooling needs throughout the state of Colorado and Wyoming. We have a large rental fleet of portable air conditioners, and offer same day delivery to your Front Range (Denver, Castle Rock, Pueblo, Golden, Boulder, Colorado Springs, Fort Collins) location from our Denver warehouse. 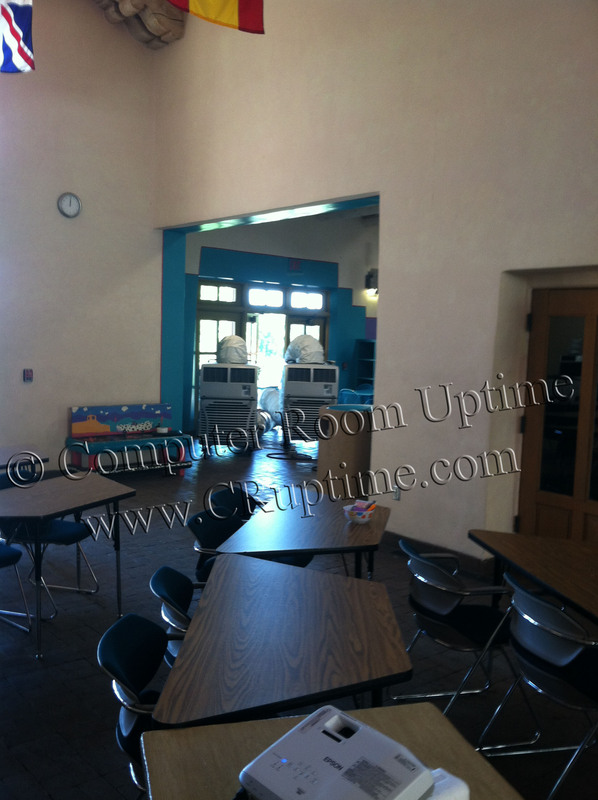 Please call Computer Room Uptime at 303-908-8043 for your next portable air conditioning rental. .
Rooftop air conditioners are a convenient and cost effective solution to cool down small to large sized commercial buildings. However these air conditioners located on the roof are exposed to the hazards of the outdoors, specifically the dangerous impact of hailstones during a thunderstorm. The National Weather Service (NWS) records indicate that from 2010 to 2013, the US experienced an average of nearly 7,000 hail reports per year. This figure only accounts for hailstones measuring more than 1 inch in size, which can be considered the threshold for damaging hail. Colorado each year has their share of thunderstorms with damaging hailstones. Last week alone we had storms move into the area each afternoon producing damaging hailstones. 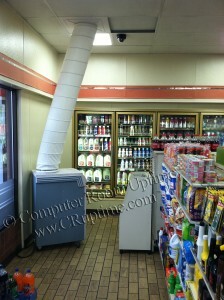 In the meantime what do you do when your place of business is becoming too hot, and scaring away customers? Renting portable air conditioners from Computer Room Uptime during this stressful period will keep your customers and workers happy while not breaking the budget. 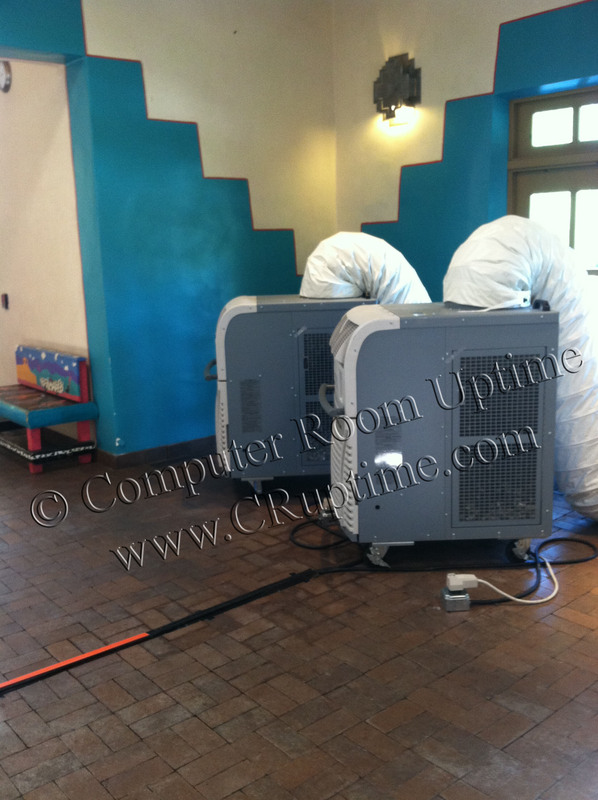 Computer Room Uptime rents portable air conditioners to all types of businesses who have damaged done to their rooftop air conditioner due to hail storms. Our Customers are diverse, and range from convenient stores, fast food restaurants, big box stores, small business offices, and medical office environments. 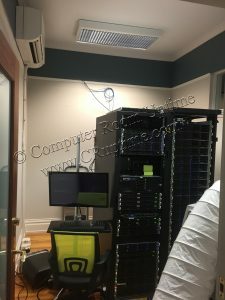 Computer Room Uptime’s team of experts will work with you to determine the most cost effective way to keep your business running smoothly during your emergency. Strategically placing the portable a/c units in the right location to keep your customers and workers happy, as well as keeping your inventory fresh and not expiring from the heat. 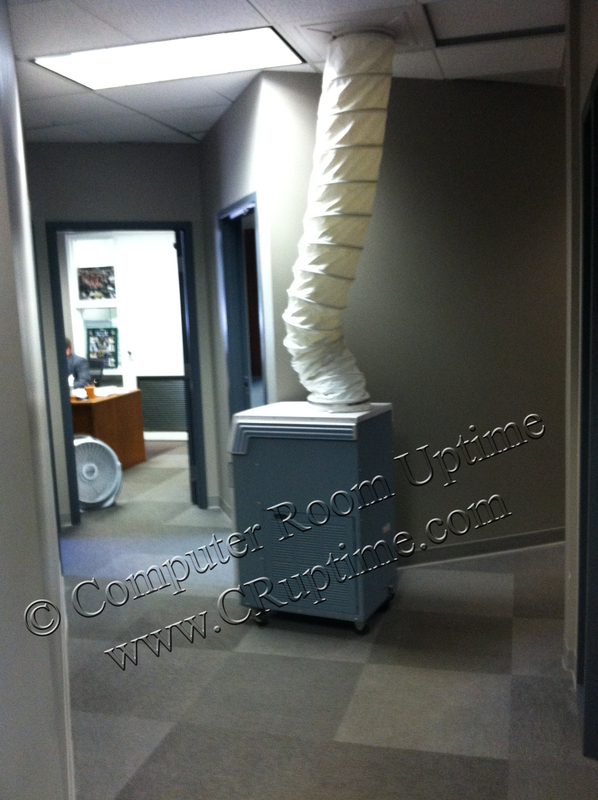 Computer Room Uptime is ready for all your temporary cooling needs throughout the state of Colorado and Wyoming. We have a large rental fleet of portable air conditioners, and offer same day delivery to your Front Range (Denver, Castle Rock, Pueblo, Golden, Boulder, Colorado Springs, Fort Collins) location from our Denver warehouse. Please call Computer Room Uptime at 303-908-8043 for your next portable air conditioning rental.